To support a world-class research and education environment, the center provides a high-level, 24/7 information environment where researchers and students are provided with one information terminal each. Because all data generated is stored on file servers, users can always access the same operational environment from any information terminal. This also prevents loss of data in case of a hardware faulure in the information terminal. When large scale or high-speed computations are necessary, this system allows free access from information terminals to any of the massively parallel computers in the center. These massively parallel computers are connected to a hierarchically configured high-speed network. These information environments are set up for easy 24-hour access, allowing users to pursue resarch and educational activities at any time. With the goal of realizing the large scale, high performance computations required for advanced research and education, massively parallel computer systems are now in use. The center provides systems with various parallel system architectures, such as shared memory systems with vector processor architecture, distributed shared memory architecture, distributed memory architecture and cluster architecture. The network system of FRONTIER is called FRONTNET, and it serves both for the connection of the campus LAN and the Wide Area Network. The LAN inside campus is a concentrated routing system using high-speed layer three switches (Cisco systems Nexus 7018, Alaxala AX6708) located in the Research Center for Advanced Computing Infrastructure. The connection between these backbone switches is 10Gigabit Ethernet to realize a large scale routing system with low latency and broadband bandwidth. Each end user has rapid and reliable access to the servers of Research Center for Advanced Computing Infrastructure and local peripherals through network via layer two switches connected to the backbone with 10Gigabit Ethernet. Juniper MX80 and Brocade NetIron XMR4000 as the designated wide area network connection router. The transmission rate is 10 Gbps to Tokyo, Osaka, and 10 Gbps to SINET which is the 10GigaBit network connecting all of Japan. 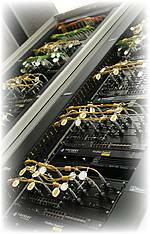 Large scale, high-speed file server systems with several hundred terabyte capacity provide the data storage facilities for research, education, administration, and other activities. The data storabe support at JAIST is managed in an integrated fashion, and maintained for high availabilitiy and high-performance service.